Suspension training is not for the faint of heart- or core! Nah, it's not that bad. It does, however, offer an unparalleled opportunity to develop stabilisers, balance and your core strength using very little but your bodyweight resistance and a few suspenders and ropes. Needless to say, Jungle Gym XT is an excellent home-gym addition that requires next to no space, and it is one of the single most useful pieces of equipment for the fitness devotee who travels extensively. If you're a novice to the concept, however, it is recommended to train under supervision of a knowledgeable professional, or at least to be absolutely certain that you are using the system effectively and safely without compromising on joint stability and integrity. So Where Does The Jungle Gym XT Fit In? TRX is a name that dominates the suspension market, so it's always good to see another company make its mark. Intriguingly, the Jungle Gym XT offers a few advances on features that irritated TRX users, which makes it well worth taking an in-depth look at too. It's impossible to browse the Jungle Gym XT for more then a few seconds without noticing one remarkable thing- its user rating. This product earns a remarkable 4.5/5 stars on popular online retailer Amazon, and for a system that's actually cheaper then its best known rivals, that seems remarkable to say the least. The very first thing worth noting about the Jungle Gym XT is that it is a split system- you are not shackled to the V shape of other suspension systems but can utilise the pieces separately for the traditional V shape, wide-angle or neural suspension. This means a huge improvement for users who wish to train in gymnastic styles, which are not easy to achieve with a fixed V system, as well as for wide-grip exercises and single strap exercises. The join strap that the model ships with means you can still use them as a single V strap system too, so you get the best of both worlds. Judging by user experience, it's a feature users love. What else does the Jungle Gym XT offer- and what do people like? Jungle Gym XT's sales pitch boasts of its foot cradle, comfortable buckles and a non-scuff feature for use with doors you'd rather not decimate the same way you want to tackle your workout. User experience certainly backs up the buckle brag, with reviewers noting that the tight alignment of the buckle with the strap adds comfort and prevents bruising and scratches. The foot cuffs also meet reviewers expectations, with many finding them a better and more comfortable shape and almost every reviewer ranking them as easier to use then in any other system. Users are also thrilled by the easy-to-clean nature of the TPE grips on the Jungle Gym XT system, seeing them as a huge step up from foam-covered offerings that discolour frustratingly- without loosing any of the comfort. They also withstand punishment, and users are satisfied with their durability. The same can be said for the entire system, which the bulk of users found durable and long lasting. They also find the straps easy to adjust- a major plus in a system like this, as you don't want to spend half your workout time faffing with the minor details. However, it does seem as through Jungle Gym missed one thing on the ‘minor details' front-there's no marking system on the straps to enable you to easily return to your favoured length for each exercise. Users have got around this with self-markings like dabs of paint, but if it's a point that's very dear to you you may wish to keep it in mind. It does seem a touch of a silly oversight. The Jungle Gym XT ships with a workout DVD to help you get going with suspension training – or at least that's what it claims. User's aren't so happy, and most say that it is not useful for a first-time user and many could have done without it. It's a nice thought that hasn't lived up to expectations, so it's fortunate it's not really the selling point of the system. Unsurprisingly, YouTube yields a few brilliant tuition and workout suggestions to help you find your way around this. The unit ships with their ‘duro-link' door anchor, an inclusion which comes in super useful and means you aren't left wallowing around trying to locate it as an extra. As a downside, if it breaks, it will not be easy to replace for the same reason- it's an integral part of the system- however next to no reviewers had an issue with the door attachment. Although not available with the core package, strap extenders are also available to give you a further 8 feet of strapping per side should you be looking for a longer primary fitments. One final point to bear in mind is that the handles on the Jungle Gym XT are only ‘semi' rotating. Some people are fine with this, whilst it is an issue for others- be sure to consider your needs before purchasing. Overall, however, it's clear that many users have had incredibly positive experiences with the Jungle Gym XT system, and that for a decent proportion of those users it in fact out-performs its more expensive counterparts- an unusual situation with exercise equipment to say the least. The Jungle Gym appears to offer users great quality at a fantastic price, and very few had other then nit-picking details to concern them with the system. 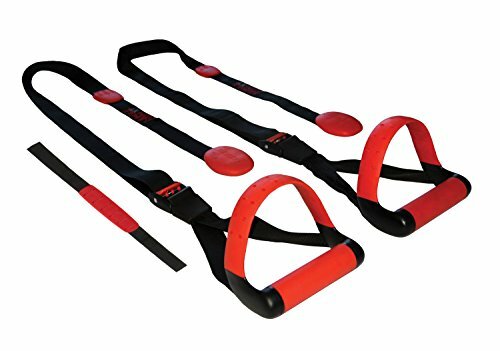 If you're in the market for a suspension training system, you can't go very wrong with this versatile, budget offering that's been well received by users worldwide.